NPT in Industrial Engineering term is Non-Productive Time. The time that is spent by an operator without producing any garment (standard minutes) like 'set up time' is called nonproductive time. In garment production, non-productive time is measured to analyze how much standard time is lost due to machine downtime. A report is made by recording machine downtime or lost time is called NPT Report. And this is as essential MIS report where factory value each standard minute of its operators. In an earlier post, I have discussed 4 major non-productive times. In this article, I will show you how factories capture NPT and make NPT report. In most factories, Industrial engineers are responsible for recording and analyzing line wise NPT for the factory. 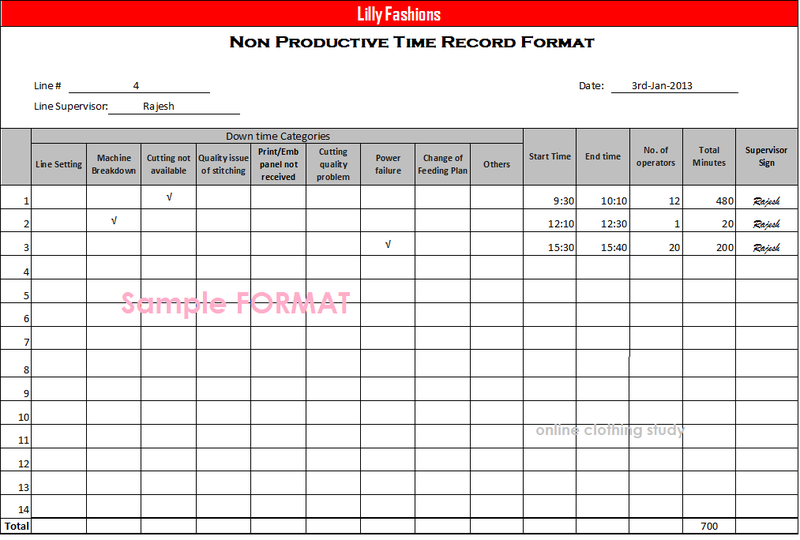 Mostly printed formats are used to record non-productive time. How much time is lost in a line is recorded as because operator wise NPT recording is near to impossible in manual tracking? Non-productive time includes criteria where major time lost. Lost time is recorded to show management a reason for low production in a particular day or lower line efficiency. Here is few example of lost time. Line setting - time lost at the time of setting up the line for new styles. A sample NPT format has been shown below for your reference. Reasons of NPT may be different in your factory. So make your own list of NPTs those occur frequently in your factory. For example, the operator sits idle due to delay in accessory receiving/approval may frequently occur in some factories and it may not happen at all in another factory. Provide a printed format to each line. Make one person responsible (line feeder, work study officer or line supervisor) to record lost time in total man minutes in the format. 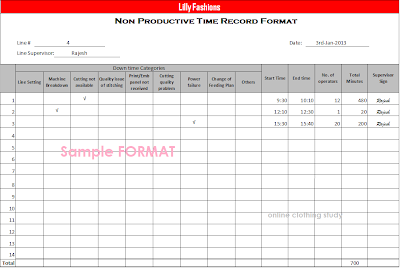 During production hours whenever you see operators to sit idle, find the reasons of not having work (or not doing the task) and note down start time and stop time, as shown in the above sample format. In case multiple operators are sitting idle for the same reason multiply lost time by number of operators to calculate total man-minutes lost and record on your NPT format. Lost time recorded under the category need to be approved by supervisor or authorized person. At the end of the day calculate total lost time in each category. How to use NPT report for process improvement? Once you have collected lost time report of a line for a period of a month you can analyse and find which NPT parameters are occurring at higher frequency. You will get clear figure how many man hours are lost due to presence of those NPT parameters in the process. All these lost man-minutes can be converted into productive minutes by improving processes and strong production planning. Now you need to think upon reducing the major lost time parameters. Do root cause analysis for occurring lost time and take an improvement project to reduce valuable standard hours. Online Clothing Study: What is Non-Productive Time (NPT) and How to Track NPT? Definition of non-production time or lost time. Method of capturing lost time used by garment manufacturers.